Medical Device Sales Representatives are professionals who sell medical products and equipment to hospitals, doctors’ office, clinics, and health systems. The job description for this post include duties such as – making cold calls, visiting the prospects premises, setting appointments with staff or administrators, managing all leads, building relationship with healthcare staff, educating or explaining about the medical devices, providing product demo, placing replenishment orders, involving in cross-selling and upselling, and promoting new products to existing customers and new customers. 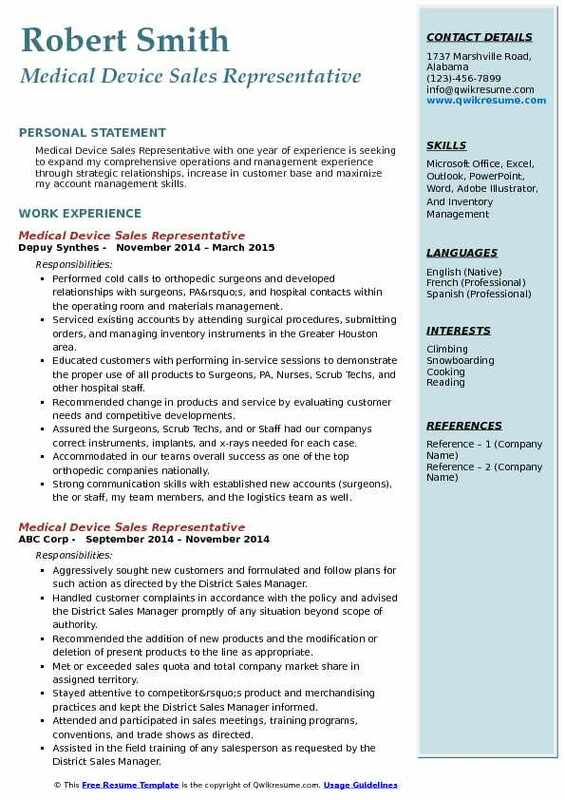 A well-drafted Medical Device Sales Representative Resume emphasizes qualifications such as – medical terminology knowledge, familiarity with various medical devices, gritty sales chops, flexibility to travel and good negotiation skills. Most of the Medical device sales representatives have a college degree, though not necessary, employers prefer degrees in the field of biology or medical science. 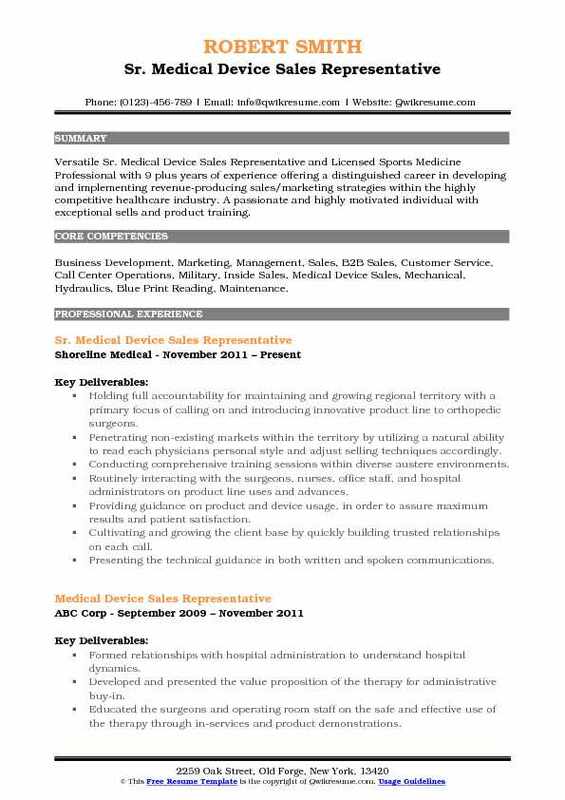 Summary : Medical Device Sales Representative II with seventeen years of experience. Self-driven professional combines seven years of commission-only medical device sales experience with the proven ability to drive business growth and quality improvements that deliver revenue growth and market penetration. Highly promotional and a strategic thinker who practices hands-on management. Developing and increasing the growth of Cardiac Rhythm Disease Management (CRDM) sales and service. Obtaining leads through heavy cold calling in West Tennessee and North Mississippi. 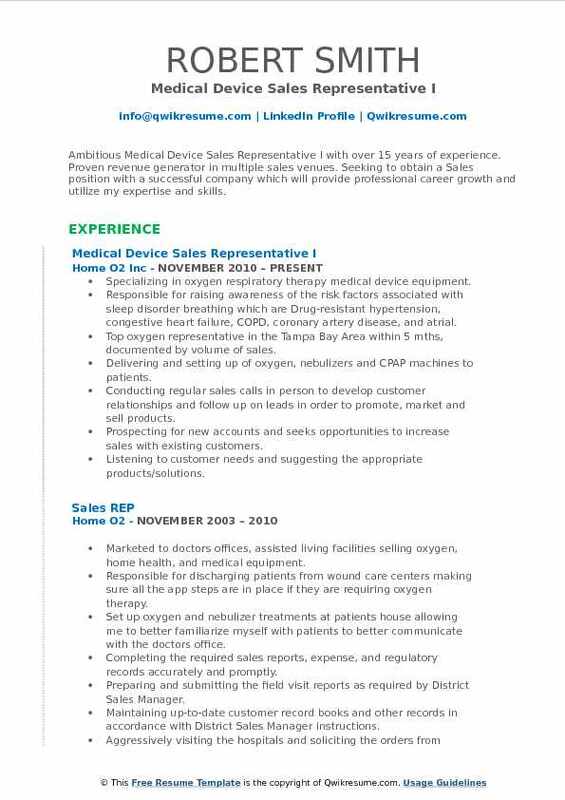 Placed in an undeveloped market with no company presence with the task of educating physicians, hospitals, and clinical support staff with the goal of earning and growing sales. Working independently to secure hospital access and earn business from key electrophysiologists, surgeons, cardiologists and internists. Creating opportunities for research, education and professional growth for physicians and clinical support staff. Responsible for routine follow-up care for each implanted device as a provided complimentary service for the physician. My value to the organization: as a straight commission sales representative increased revenue by over 800%. Building professional relationships and gaining the trust of key electrophysiologists, surgeons, cardiologists, internists and patients. Worked four years as the sole sales representative for Biotronik in a territory, assuming all responsibilities for administration, management, sales and customer service. Summary : Highly accomplished, award-winning Senior Medical Device Sales Representative and Brand Positioning Expert with diverse experience of 9 years in sales and marketing to hospitals and physicians. In-depth technical knowledge and clinical acumen in therapeutic areas including Respiratory, Pulmonary Women's Health, and Asthma, Allergy able to promote highly technical and innovative product portfolio to sophisticated audiences. Accountable for selling, promoting and delivering a portfolio of products and services to accounts in two counties and contributing to regional and national sales target goals. Responsible for the management, promotion, marketing, strategic planning, growth strategies and selling diagnostic products/services in specialty markets of respiratory, pulmonary, and asthma allergy. Involved in the entire sales cycle process by sourcing opportunities, uncovering the specific need, assessing appropriate medications and devices, closing sale and follow-up with customers. Select accomplishments: successfully exceed monthly sales quotas and requirements. #1 volume producer status and newest member of the sales team in the branch. Personally generated more than 80% ($775k) in brand new business for respiratory product portfolio. Two times recipient of quota buster award for #1 sales performance and market share growth in NY/NJ region. Calling on existing and prospective customers, providing product information and quote appropriate customer prices, and developing new accounts and grow existing accounts within the established geography. Consistently delivering compelling medical presentations, represent Lincare as a leader in the marketplace and promote a technical and innovative product portfolio. 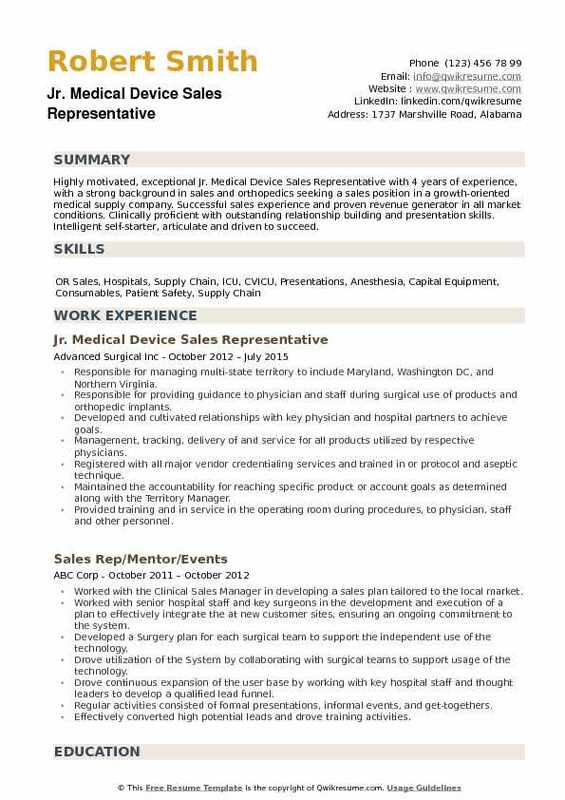 Objective : Junior Medical Device Sales Representative with 4 years of experience and with a diverse skill set calling on healthcare providers. Medical device and operating room experience with expertise calling on General Surgeons. Driving sales by providing education and assistance with Ethicon’s entire hernia portfolio in operating rooms and office settings for key hospitals. Launched 4 new products: Ultrapro advanced, open Physiomesh, Open Securestrap, Stratafix suture. Collaborating with division and regional leaders to identify potential growth opportunities in geography. Executing the brand strategies to ensure consistent company sales and marketing message. Effectively allocating the Ethicon resources for sampling, evaluations, professional education and dinners. Strategically arranging meetings with key opinion leaders to discuss our current and future product portfolio. Developing strategic partnerships, and maintain long-term working relationships with surgeons, nurses and materials managers on advanced energy solutions. Providing an administrative support to materials managers to ensure the efficiency of sales operations to include evaluating the purchasing and pricing practices employed, contracts and specifically targeted physicians. 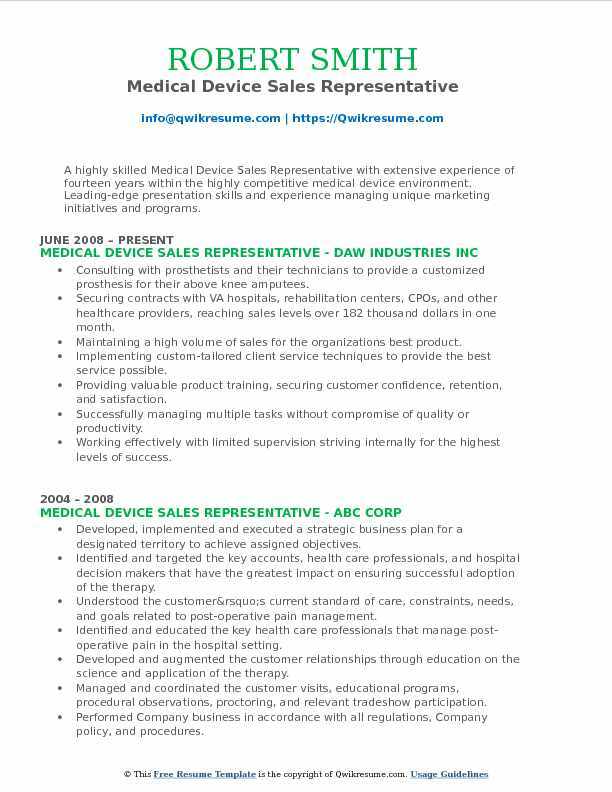 Summary : Ambitious Medical Device Sales Representative I with over 15 years of experience. Proven revenue generator in multiple sales venues. 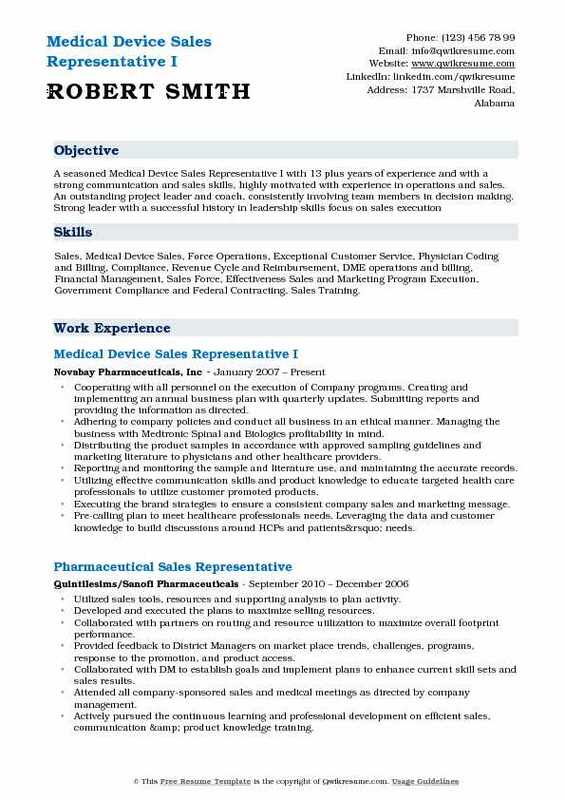 Seeking to obtain a Sales position with a successful company which will provide professional career growth and utilize my expertise and skills. Specializing in oxygen respiratory therapy medical device equipment. Responsible for raising awareness of the risk factors associated with sleep disorder breathing which are Drug-resistant hypertension, congestive heart failure, COPD, coronary artery disease, and atrial. Top oxygen representative in the Tampa Bay Area within 5 mths, documented by volume of sales. Delivering and setting up of oxygen, nebulizers and CPAP machines to patients. Conducting regular sales calls in person to develop customer relationships and follow up on leads in order to promote, market and sell products. Prospecting for new accounts and seeks opportunities to increase sales with existing customers. Listening to customer needs and suggesting the appropriate products/solutions. Ensuring that the customers are serviced in accordance with company standards and policies. Ensuring that customer satisfaction and obtains regular feedback and continually works to improve processes and services. 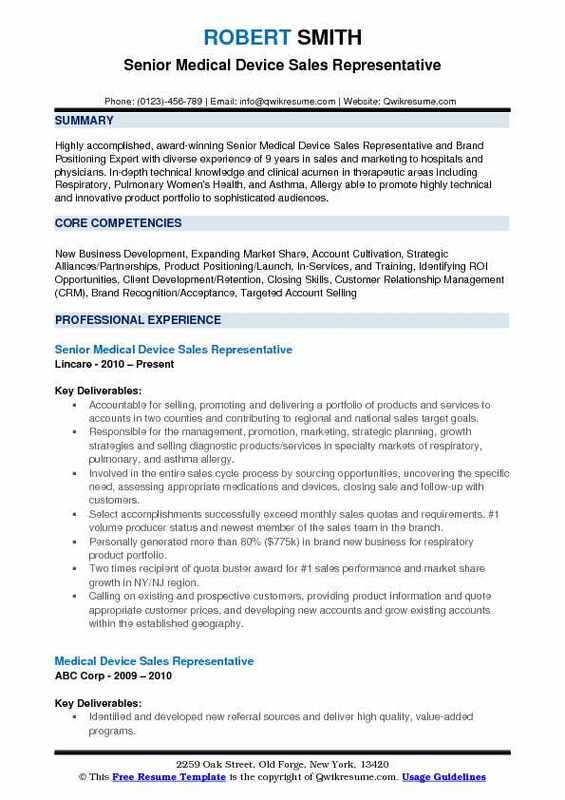 Objective : Medical Device Sales Representative with one year of experience is seeking to expand my comprehensive operations and management experience through strategic relationships, increase in customer base and maximize my account management skills. Performed cold calls to orthopedic surgeons and developed relationships with surgeons, PA’s, and hospital contacts within the operating room and materials management. Serviced existing accounts by attending surgical procedures, submitting orders, and managing inventory instruments in the Greater Houston area. Educated customers with performing in-service sessions to demonstrate the proper use of all products to Surgeons, PA, Nurses, Scrub Techs, and other hospital staff. Recommended change in products and service by evaluating customer needs and competitive developments. Assured the Surgeons, Scrub Techs, and or Staff had our company's correct instruments, implants, and x-rays needed for each case. Accommodated in our team's overall success as one of the top orthopedic companies nationally. Strong communication skills with established new accounts (surgeons), the or staff, my team members, and the logistics team as well. Skills : Sales, Medical Device Sales, Force Operations, Exceptional Customer Service, Physician Coding and Billing, Compliance, Revenue Cycle and Reimbursement, DME operations and billing, Financial Management, Sales Force, Effectiveness Sales and Marketing Program Execution, Government Compliance and Federal Contracting, Sales Training. Cooperating with all personnel on the execution of Company programs. Creating and implementing an annual business plan with quarterly updates. Submitting reports and providing the information as directed. Adhering to company policies and conduct all business in an ethical manner. Managing the business with Medtronic Spinal and Biologics profitability in mind. Distributing the product samples in accordance with approved sampling guidelines and marketing literature to physicians and other healthcare providers. Reporting and monitoring the sample and literature use, and maintaining the accurate records. Utilizing effective communication skills and product knowledge to educate targeted health care professionals to utilize customer promoted products. Executing the brand strategies to ensure a consistent company sales and marketing message. Pre-calling plan to meet healthcare professionals' needs. Leveraging the data and customer knowledge to build discussions around HCP's and patients’ needs. Delivering accurate and timely follow-up discussions with Healthcare providers and office staff. Fostering an ongoing trust with the Healthcare Providers. Summary : A highly skilled Medical Device Sales Representative with extensive experience of fourteen years within the highly competitive medical device environment. Leading-edge presentation skills and experience managing unique marketing initiatives and programs. Skills : Product Management, Training, Client Management, and Professional Presentations, highly proficient in Infrastructure Implementation, Sales/Sales Support, and Garnering Business Referrals. Consulting with prosthetists and their technicians to provide a customized prosthesis for their above knee amputees. Securing contracts with VA hospitals, rehabilitation centers, CPOs, and other healthcare providers, reaching sales levels over 182 thousand dollars in one month. Maintaining a high volume of sales for the organizations best product. Implementing custom-tailored client service techniques to provide the best service possible. Providing valuable product training, securing customer confidence, retention, and satisfaction. Successfully managing multiple tasks without compromise of quality or productivity. Working effectively with limited supervision striving internally for the highest levels of success. Efficiently utilizing strong organizational skills to achieve results surpassing individual as well as the organization's expectations. Created a strong network of new and potential clients based on strong product knowledge and customer service. 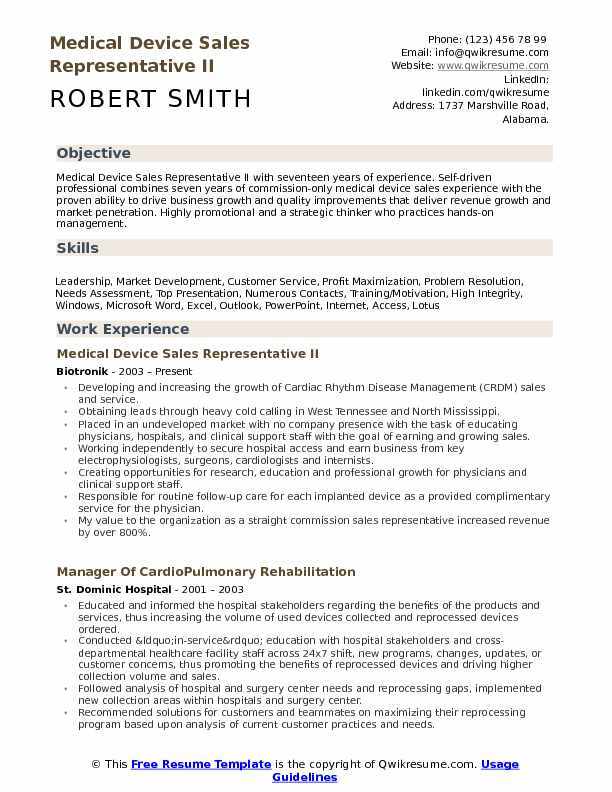 Summary : Versatile Sr. Medical Device Sales Representative and Licensed Sports Medicine Professional with 9 plus years of experience offering a distinguished career in developing and implementing revenue-producing sales/marketing strategies within the highly competitive healthcare industry. A passionate and highly motivated individual with exceptional sells and product training. Skills : Business Development, Marketing, Management, Sales, B2B Sales, Customer Service, Call Center Operations, Military, Inside Sales, Medical Device Sales, Mechanical, Hydraulics, Blue Print Reading, Maintenance. Holding full accountability for maintaining and growing regional territory with a primary focus of calling on and introducing innovative product line to orthopedic surgeons. Penetrating non-existing markets within the territory by utilizing a natural ability to read each physician's personal style and adjust selling techniques accordingly. Conducting comprehensive training sessions within diverse austere environments. Routinely interacting with the surgeons, nurses, office staff, and hospital administrators on product line uses and advances. Providing guidance on product and device usage, in order to assure maximum results and patient satisfaction. Cultivating and growing the client base by quickly building trusted relationships on each call. Presenting the technical guidance in both written and spoken communications. Instrumental in streamlining operational processes and driving system improvements by creating solutions for inventory control, sales reporting, distribution and product upgrades. Exceeded all expectations, constantly above quota, and maintained all new accounts. 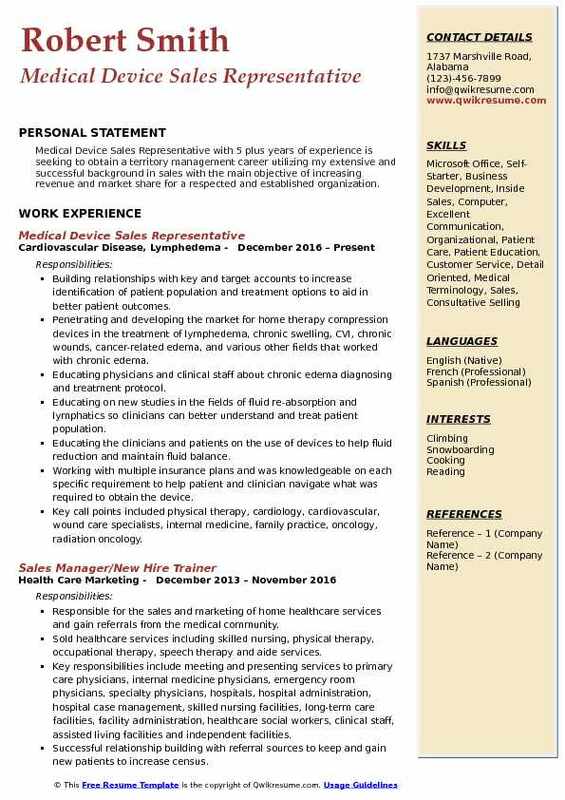 Headline : Medical Device Sales Representative with 5 plus years of experience is seeking to obtain a territory management career utilizing my extensive and successful background in sales with the main objective of increasing revenue and market share for a respected and established organization. Building relationships with key and target accounts to increase identification of patient population and treatment options to aid in better patient outcomes. Penetrating and developing the market for home therapy compression devices in the treatment of lymphedema, chronic swelling, CVI, chronic wounds, cancer-related edema, and various other fields that worked with chronic edema. Educating physicians and clinical staff about chronic edema diagnosing and treatment protocol. Educating on new studies in the fields of fluid re-absorption and lymphatics so clinicians can better understand and treat patient population. Educating the clinicians and patients on the use of devices to help fluid reduction and maintain fluid balance. Working with multiple insurance plans and was knowledgeable on each specific requirement to help patient and clinician navigate what was required to obtain the device. Key call points included: physical therapy, cardiology, cardiovascular, wound care specialists, internal medicine, family practice, oncology, radiation oncology. Accomplished, taking a struggling territory that was part of the Chicago market and increasing revenue by 60% in 1 year. 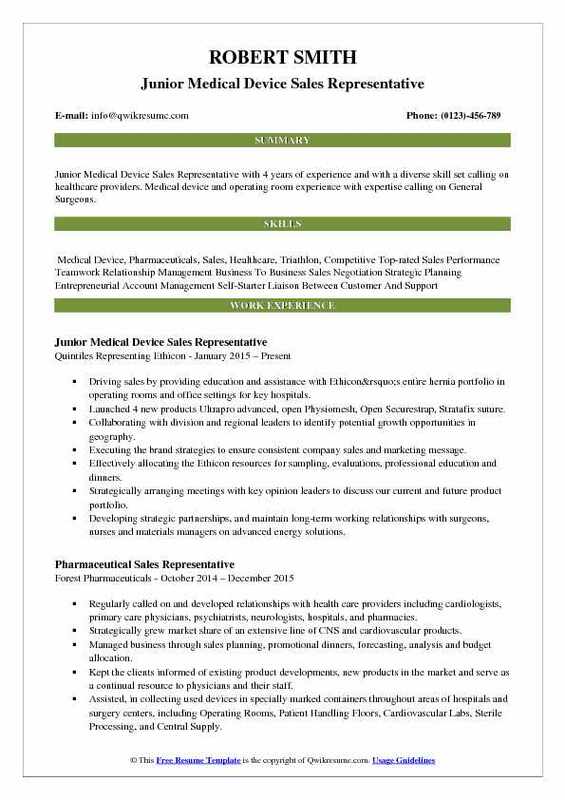 Objective : Highly motivated, exceptional Jr. Medical Device Sales Representative with 4 years of experience, with a strong background in sales and orthopedics seeking a sales position in a growth-oriented medical supply company. Successful sales experience and proven revenue generator in all market conditions. Clinically proficient with outstanding relationship building and presentation skills. Intelligent self-starter, articulate and driven to succeed. Responsible for managing multi-state territory to include Maryland, Washington DC, and Northern Virginia. Responsible for providing guidance to physician and staff during surgical use of products and orthopedic implants. Developed and cultivated relationships with key physician and hospital partners to achieve goals. Management, tracking, delivery of and service for all products utilized by respective physicians. Registered with all major vendor credentialing services and trained in or protocol and aseptic technique. Maintained the accountability for reaching specific product or account goals as determined along with the Territory Manager. Provided training and in service in the operating room during procedures, to physician, staff and other personnel. Called upon customers in the hospital and in the office setting. Developed and utilized the sales presentation skills to sell company products in an assigned territory or product area via consultative selling. Acquired, maintained and expanded the knowledge of company's products, competitive landscape, and the market in order to meet the customers' needs.